Horse IgG (PEP001) detected with Mouse anti Horse IgGa (MCA1902GA) followed by Rabbit F(ab')2 anti Mouse IgG:HRP (STAR13B). 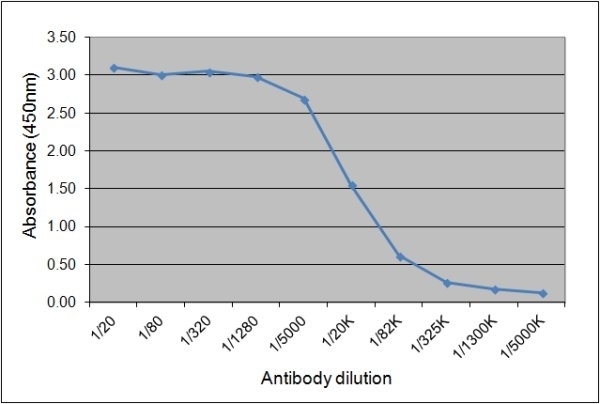 Mouse anti Horse IgGa antibody, clone CVS48 recognizes equine IgGa, and shows no significant binding to other IgG sub-classes. In addition to Mouse anti Horse IgGa antibody, clone CVS48, we also offer a range of other monoclonal and polyclonal antibodies that are specific to equine immunoglobulins. Spleen cells from immunized Balb/c mice were fused with cells of the mouse X63-Ag8.653 myeloma cell line. Sheoran, A. S. et al. (1998) Monoclonal antibodies to subclass-specific antigenic determinants on equine immunoglobulin gamma chains and their characterization. Vet. Immunol. Immunopathol. 62: 153-165. Lewis, M. J. et al. (2008) The different effector function capabilities of the seven equine IgG subclasses have implications for vaccine strategies.